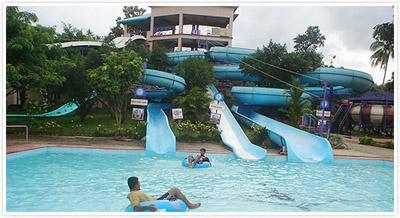 Silver Storm water theme park is situated in Vettilapara in Thrissur district of Kerala. It lies close to the Athirappilly waterfalls which makes it easier for the visitors to enjoy both the attractions of Thrissur in one day itself. 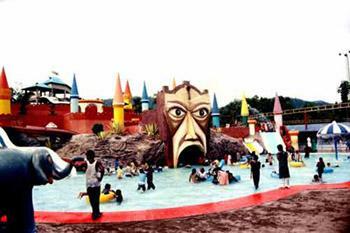 This water theme park is famous for some of its attractions which have been introduced for the first time in South India. The entertainment facilities offered by Silver Storm are truly world class and unique. The rides available here are a blend of man made wonders and natural wonders. A few of the rides can be found only at Silver Storm and not in any of the other amusement parks of South India. There is a Children's Village in which pet animals and birds roam around the place freely which can be thrilling for kids who love pets. Other attractions for children are Viking Ship, fish ponds and carnival games. The park also has people dressed up as cartoon characters to greet families and dance with the children. Silver Storm water theme park was opened by a group of NRI entrepreneurs with financial support from the Kerala State Industrial Development Corporation Ltd (KSIDC). So far, the park consists of five phases and each of these phases were inaugurated in different years one after the other. The rides in the park are divided into each of these phases. 1. Flying Dutchman - This ride is a group of planes which takes the person through an amazing 20 feet. It is sure to remain as an unforgettable and most enjoyable ride. 2. Wave pool - This ride is similar to the wave pools found in many of the other water theme parks. It is one of the most fun-filled part in the park where the entire family or group can stand inside the wave pool and wait till the waves come splashing towards them. 3. Kids pool - This is the best place for the young kids to be in. As it is a kids pool, all the necessary safety measures have been placed to make the pool an exciting place for the tiny tots. 4. Master Blaster - This is another fun-filled water ride which is suitable for people of all age groups though it is advisable for very young children to stay away from it as the slides are of great heights. These slides end at the pool so the person who goes in this ride can expect a great climax when they reach the end of the slides. 5. Hara Kiri - This is one of the dry rides in the water theme park. In this ride, one or two people can sit on a float provided by the park and go down the slides. But unlike the other rides, this slide does not end up with a splash in the water. 6. Mama Aqua Dance - This is another fun-filled place especially for teenagers and young couples. It is an area where one can dance amidst the water which keeps sprinkling from all sides. Blasting music and soft disco lights are also kept to turn the place into a water-filled discotheque. 7. Baby train - This ride is meant for the tiny tots. It is a small train which will excite the young ones as they move over the tracks in medium speed. 8. Turbo Twister - It is a round red and white coloured tube in which one can twirl around for sometime till he is invited into the swimming pool set at the middle of the tube. 9. Striking cars - Striking cars are common in almost all the parks and it is an exciting and thrilling ride for young people. But the Striking cars at Silver Storm are innovative in its scientifically created spherical design. It is the only park in entire Kerala to have this kind of design. The striking cars also have joystick controls in place of the steering wheels which enables faster and efficient movement. 10. Bumping boats - Bumping boats are similar to striking cars except that the thrill of the water is added in this ride. Two or more people sit together in floats and bump into other floats creating an exciting time for friends and family. 11. Jurassic Splash - This ride will take one to the ancient times when dinosaurs and dragons are known to have existed. The waves from the water gush into the mouths of the huge statue of Jurassic times. 12. Wild Raft Ride - In this ride, two people can sit together in one float and whirl around the huge tubes till they land straight into the water below. 13. Super splash - This is a very smooth ride which is equally thrilling and memorable. 14. Sky Jet - This is one of the most unique rides created by the park. It is a thrilling and exciting ride which will surely leave you satisfied. This ride is mainly meant for the adventurous type of people who are ready to experiment with their adrenaline levels. It operates at a height of 30ft with a running span of 1000ft. From this height, one can enjoy the aerial view of the entire park by cycling around the park. Some of the other rides available at Silver Storm water theme park are Kids Turbo Slide, Tea Cup, Swinging Roller Coaster, Chinese Village, Columbus, Wild Body, Swing chair, Dragon coaster, Rain dance (with 10000 Watts music), Cricket Bowling Machine, New Striking car, Surf Hill, Kids Super Slide, Kiddies Free Fall, Lazy Mountain River, Kids dry games, and Pearl Aquarium. The Chinese Village consists of the following attractions - Dragon coaster, Tea cup, Swing chair, Funny copt, Hokcycle, Neecoxpress, Hopper Wagon and Smile Cat. Some of the facilities offered by the park are high classed restaurants, changing rooms, locker facility, parking area, telephone booths, food courts, ice cream parlour, first aid area, taxi on call, doctor on call, prayer hall, dormitory, toilets, rest rooms for handicapped and old age and gift shops. Silver storm also organises special occasions such as corporate parties, birthday parties, special events, private parties and family get-togethers. Special discounts are given for people coming in large groups. No extra cost is charged for making advance bookings. The gift shops sell a good range of gift items such as toys, costumes, CD's, cassettes, T-Shirts and cosmetics. The park also provides A/C and non A/C cottages as well as dormitories close to the park vicinity. These cottages provide all the necessary facilities such as restaurants and security.